Is Red The New Green? In yesterday's weekly indicator review, I noted that the colors were starting to change on some of our longer-term, big-picture market models. To be clear, this is NOT a reason to panic, don the helmet, or head for the hills. However, it is a reason to sit up, take notice, and pay attention because all may not be as it seems at this juncture. I have said many times that you can often get the "message" from the indicator boards simply by glancing at the colors of the boxes. So, you don't need to be a technical geek and/or plow through 50 model readings in order to get something out of my weekly update. A lot of green is good, yellow means caution, and red, well, you get the idea. Here's the gist of yesterday's report in two indicator boards. 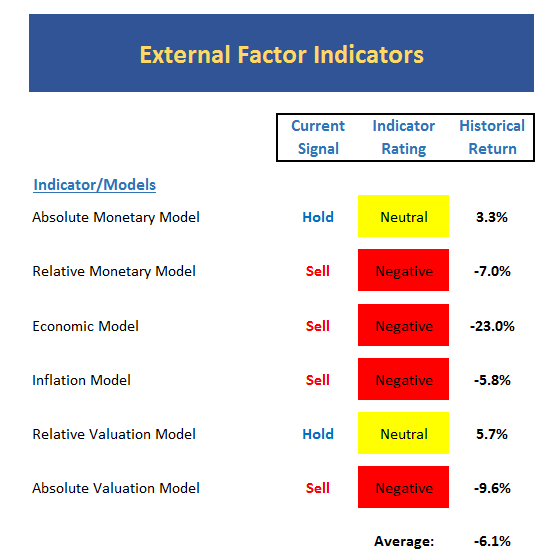 The first covers the "external factors" of the market. This is big-picture, non-trend stuff like interest rates, economic conditions, inflation and valuations. This board doesn't change much and for quite some time, it has sported a decent shade of green. In short, this told us that the odds favored the bulls. That's a lot of red, right? And it is worth noting that there is nary a single green box on the board. Uh oh! But let's remember that these types of models are designed to give us a feel for the state of the environment - and NOT when to buy or sell. Another way to look at this board is it tells us what type of winds investors are experiencing on their journey. A lot of green on this board means investors can expect a nice tailwind and a shorter-than normal flight while red suggests a stiff headwind, which usually means your flight is going to take a bit longer than normal. My view on the message from this board is: rates are rising, inflation is heating up, and valuations are stretched. Which, when you say it out loud, doesn't sound so good. 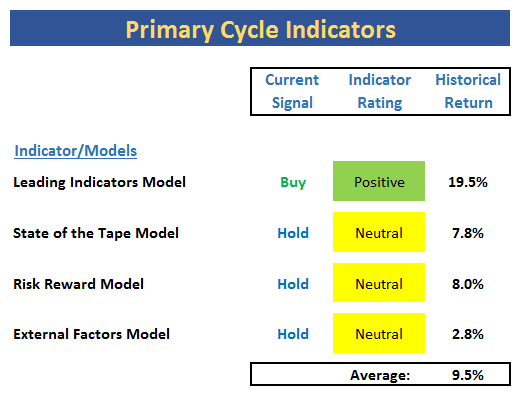 Then there is the Primary Cycle board, which is basically a group of my favorite longer-term models. In short, I use this combo to remind me which team is likely to remain in control of the game. But again, none of these models are particularly good at "timing" when to take action. No, the goal here is to determine the big-picture environment, so that one can attempt to play the game accordingly. Looking objectively at these two boards, it is hard to be overly optimistic about stocks. One board is a sea of red and the other sports an abundance of yellow. However, this is when understanding the components of the models can be of helpful. And in my humble opinion, things aren't as bad as they may look. You see, the External Factors board is basically waving one big sign that reads, "Beware - Interest Rates Are Rising!" And then another that says, "Inflation is Heating Up." The problem is that when looking back at history, stocks don't tend to fare well when rates are rising, inflation is heating up and valuations are high. It is said that in the investing game, the quickest way to financial ruin is to rely on the words, "But this time it's different." The idea here can be summed up by yet another well-known cliché. "Those who ignore history are doomed to repeat it." However, it is important to recognize that while interest rates are indeed rising, they are (a) moving up from all-time lows and (b) rising for the right reason! As such, it can be argued that unlike prior rising rate cycles, this time rates are not likely to "bite." It is also worth noting that this time around, the Fed is most definitely not trying to fight inflation or slow the economy. No, Janet Yellen's merry band of central bankers is merely trying to return rates to more normalized levels. Put another way, the patient (the U.S. Economy) no longer requires life support (the extreme measures taken by the Fed to keep the economy out of a deflationary cycle). And from a medical perspective, this is usally a good thing! Next, let's remember that inflation is currently the GOAL - and NOT the problem it has been in the past. Lest we forget, the central bankers of the world have been trying everything they can think of to INCREASE inflation - not fight it. Again, with inflation being the goal, it very well could that our inflation model itself is confused. You see, this time is quite a bit different from the cycles that the model has been designed to warn against. So, will this time be different? We can't know for sure. But I can say that I am not quaking in my boots over the negative readings seen in the inflation and monetary models. In fact, I could argue that because of the way these models were built, the fact that they have now turned red, is actually a good thing during this cycle. Fingers crossed!